In late March, speaking to the Vancouver Rotary Club, we had a great conversation on the 4 Way Test and Collaboration. In early April in San Luis Obispo, California, Stacey Hunt and Ecologistics hosted our workshop. The focus was on convening a safe, respectful and collaborative focused dialogue on energy and community. Duncan Autrey, Doreen Liberto and I (Collaborative Global Initiative) were told; “In all the time we have been hosting Critical Conversations monthly sessions, this was the most engaging for our community.” We are now planning to move forward with the inclusion of more stakeholders and the Center For Innovation at Cal Poly. 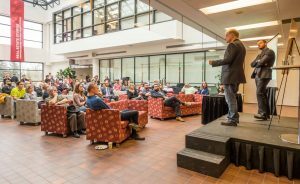 Mid- April, at the Haskayne School of Business at the University of Calgary, David Milia hosted Dan Clarke (CSV Midstream) and I for a talk: Collaboration is the Way. Shared Value is the Destination. We are convening an ongoing Forum with leaders in business, community, politics, not for profits and more to evolve this paradigm shift from “silo limited business” to business that is informed by the people and the planet. In Cranbrook, British Columbia, we hosted a workshop on Collaboration in the Kootenays at the Public Library. 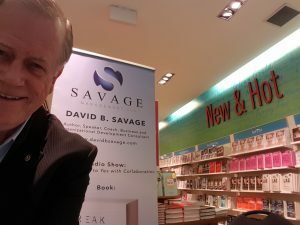 We have more book signings at Indigo Spirit stores in downtown centres, more Rotary talks and more workshops with companies, not for profits and professional associations. Every event is designed to serve the interests of the host group. Topics in focus this month have included the future of energy health care guides, corporate boards of directors, international businesses with business teams in several nations and the cultural differences in multinational organisations. All are looking at how to unlock the possible (and get past the barriers). The base case is a great one-day event. The better case is one that focusses directly on you and your team. The best case is when it becomes parts of your culture. Join the movement and Break Through To Yes.